Welcome to the official site of the Etwall Well Dressing Association! Etwall village in Derbyshire has staged an annual Well Dressing Festival on the third weekend in May since 1970. The Well Dressing Festival attracts visitors from far and wide and is a major source of the village’s sense of identity. The well dressings are designed, produced and mounted by societies, clubs and groups of residents and celebrate a variety of themes. The event raises money for prominent local charities and contributes substantially to the local sense of community. If you want to know more about how Well Dressings are made, visit our ‘How to’ page. To see some examples of Well Dressings have a look at our Gallery pages. Photos of previous years Well Dressings can be found by visiting the welldressing.com website. 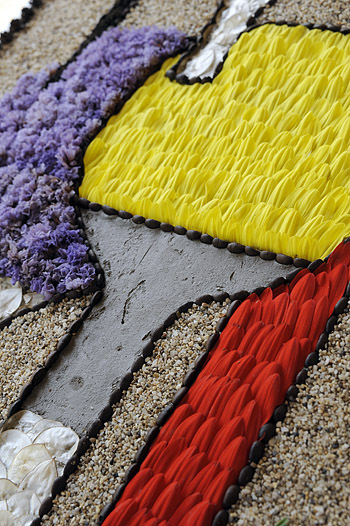 Would you like to watch one of this year's well dressings being made? To book a visit on a day during the period leading up to Well Dressings, please ring either 01283 734233 or 0781 2024722. For more information please contact the Secretary of the Etwall Well Dressing Association on (01283) 733446 or via Email. Click here to visit the Etwall Village website.